Ive been researching bonsai and how to do it for about a month now, finally got my first two tree's on wednesday. 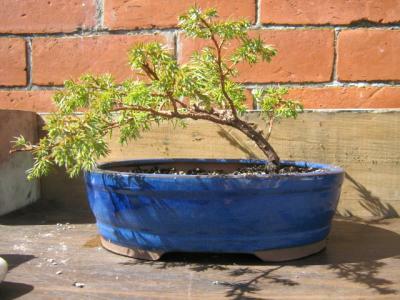 This photo is my first ever bonsai a Juniper Depressa Aurea. I have just completed my second tree today (friday). This one though had a natural bend in the trunk of it so it pretty much made itself. I think its beautiful. i agree, its a great specimen. a smaller pot would make it look older and bigger. please post more pictures in the future. I would love to watch your bonsai at its best. I agree with the previous sender, But only repot it in the next year in a smaller pot. Your tree has so much potential. You should send a picture of it now. Great natural form!